The majority of Windows administrators, who are familiar with PKI, know about the MakeCert.exe utility, which allows to create a self-signed certificate. This tool is included in the Microsoft .NET Framework SDK and Microsoft Windows SDK. In Windows 8 and Windows Server 2012, a self-signed certificate can be created using PowerShell 3.0 (or higher) without any special tools. To list all available cmdlets in the PKI module, run the command. It is recommended to use a self-signed certificate for testing purposes or to provide certificates for Intranet services (IIS, Exchange, Web Application Proxy, LDAPS, ADRMS, DirectAccess etc.) if for some it is impossible to deploy a PKI/CA infrastructure or purchase a trusted certificate from an external provider. Tip. Don’t forget that you can easily get a free SSL certificate from Let’s Encrypt. 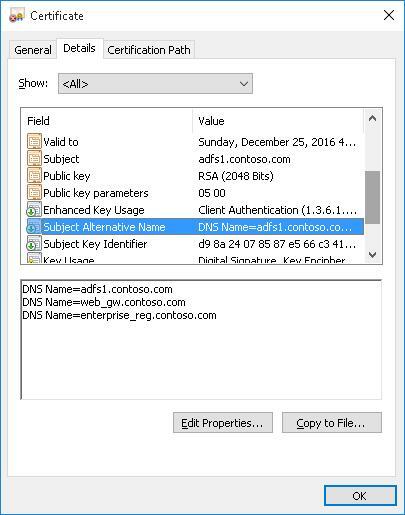 Here’s an example of how to issue the SSL certificate from Let’s Encrypt and bind it to the IIS site on Windows Server 2012 R2. To create a certificate, you have to specify the values of –DnsName (DNS name of a server, the name may be arbitrary and different from localhost name) and -CertStoreLocation (a local certificate store in which the generated certificate will be placed). 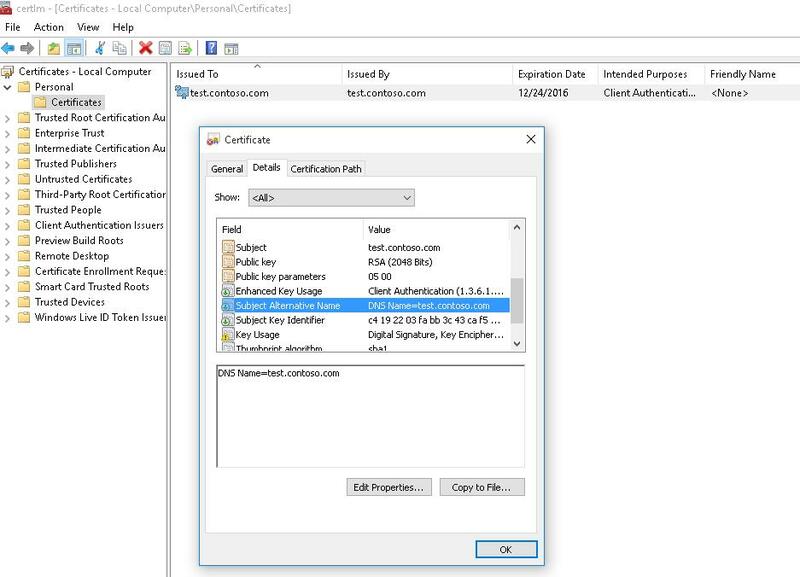 You can use the cmdlet to create a self-signed certificate in Windows 10 (in our example), Windows 8/8.1 and Windows Server 2016/ 2012 R2 /2012. This command creates a certificate and imports it in a personal store of the computer. Having opened certlm.msc snap-in, make sure that a new certificate has appeared in the Personal section of the certificate storage. As you can see, the certificate properties indicate that this certificate can be used for Client Authentication, but it is also valid for Server Authentication. This public key or the certificate file itself can be installed on a web-server or domain clients using GPO (How to install a certificate on a domain PCs using GPO). One of the useful features of New-SelfSignedCertificate cmdlet is the opportunity to create a certificate with several different names Subject Alternative Names (SAN). Note. When creating a certificate with several names, the first name in DnsName parameter will be used as CN (Common Name) of a certificate. Also, you can issue a certificate for the entire namespace in the domain. To do it, specify *.contoso.com as a server name. In PoweShell 3.0, the New-SelfSifgnedCertificate cmdlet was generating only SSL certificates that couldn’t be used to sign the driver and application code (unlike certificates generated by the MakeCert utility). In PowerShell 5 the new version of the New-SelfSifgnedCertificate cmdlet can now be used to issue a Code Signing certificates. If you are receiving an UnknownError warning when executing the command, this means that the certificate is not trusted, because it is located in the user’s personal certificates store. You need to move it to the trusted root certificates (don’t forget to periodically scan the Windows certificate root store for suspicious certificates and update the lists of trusted root certificates). Move-Item -Path $cert.PSPath -Destination "Cert:\CurrentUser\Root"
After that, you can sign your PowerShell script with this self-signed certificate. Note. Unlike MakeCert, New-SelfSifgnedCertificate cmdlet allows to issue only an SSL certificate, which can not be used to sign a driver or an application code. Does this mean that if we are interested in code-signing, that PowerShell cannot be used to generate a certificate? I have been unable to use the New-SelfSignedCertificate cmdlet to create a code-signing cert that can be used to sign Powershell scripts. Whenever I attempt to sign a PS script with my cert using Set-AuthenticodeSignature, it displays Status of UnknownError. However, the certs that I create using makecert work just fine. Has anyone ever attempted to sign a PS script with a cert created by New-SelfSignedCertificate? Worked for me with an elevated Powershell. I’m a novice and spent many hours googling on how to create a simple IIS 10 test certificate. I ran the second PowerSheel command from this tutorial and I’ve got it in 10 seconds! Thanks a million. a) the “Key Usage” has a yellow alert and it support only “Digital Signature and Key Encipherment”, but it does not include “Data Encipherment” as SelfSSL7 tool includes. b) PowerShell Cert includes Client and Server authentication, and SelfSSL7 only includes Server authentication, so, I am not 100% sure if there is a PowerShell command to build the Self-Signed only for Server authentication. I know how to use uncheck in the Cert Client authentication, I just wondering if I can build the cert without the Client part, many thanks.